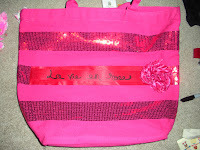 la vie DIY: DIY Tote Update/Personalize it! Just a very quick note from me today. I'm overwhelmed here! There's so much to be done before John gets home and I haven't even started... oops! I want to give you a few little tips and tricks for totes. 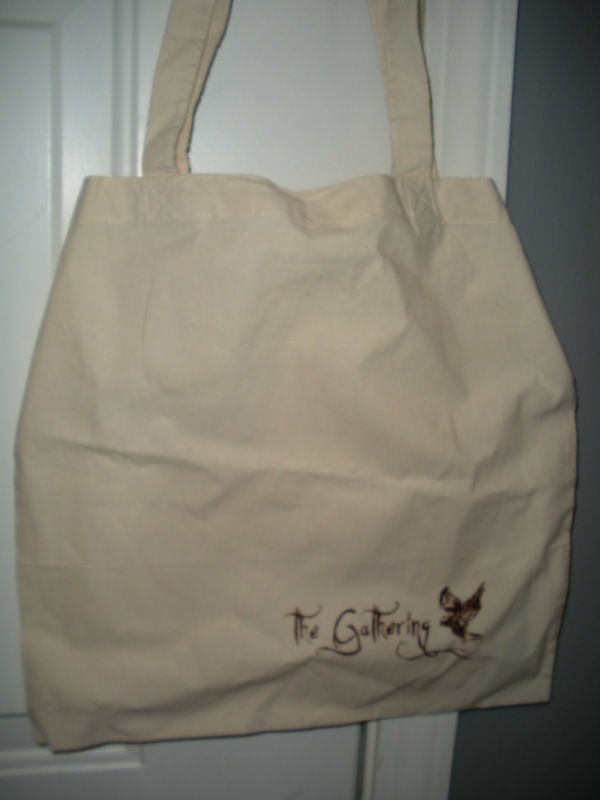 Have you ever gotten a free tote? I get them all the time. I get them at events or from retailers and they're so useful, but I dislike the logos. The one I worked with today came from Victoria's Secret. 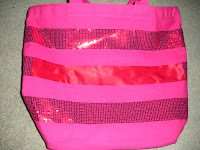 I like VS, but I don't want to carry around a tote with their logo plastered across it. I decided that it was time to cover it up! 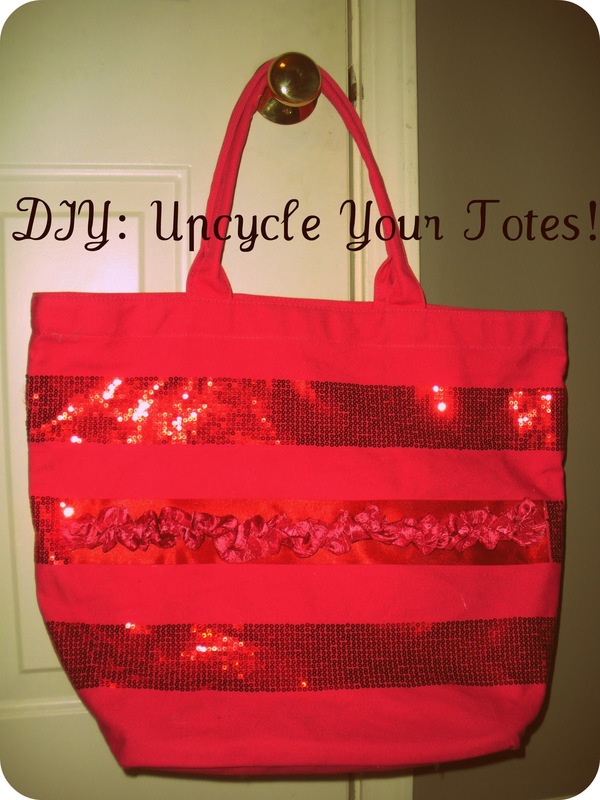 And if you have a tote that you want to cover up, or maybe just a plain tote you want to spice up... take a look! A) Fabric. I didn't picture this, but the easiest way is to take a patch of fabric and got glue it right over the logo. You can leave it at that, or you can embellish it. If you want to embellish it, keep reading. B) Ribbon. This is what I did. I took 2 strips of ribbon (because I didn't have one that was wide enough) and hot glued it right over their logo. Ideally, I would have put a third in the middle of the two to create some pretty lines. It would have been red underneath and then a pink ribbon running down the middle above. For the record, the ribbon that I used is the exact same shade of red as the sequence, but for some reason it didn't photograph that way. C) Bling. Crystals, silk flowers, whatever! You can do this alone if it's a smaller logo, or you can count this as embellishment for the ribbon/fabric. Now let's talk about embellishment. 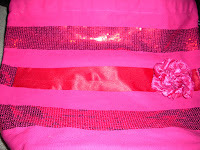 I would have loved to do sequence all the way across the ribbon in a contrasting shade, but I didn't have any on hand. So, I did a few options with what was available. If you didn't catch yesterday's blog about THE DIY RUFFLE SHIRT, I mentioned that I was really into using gathered fabric lately. 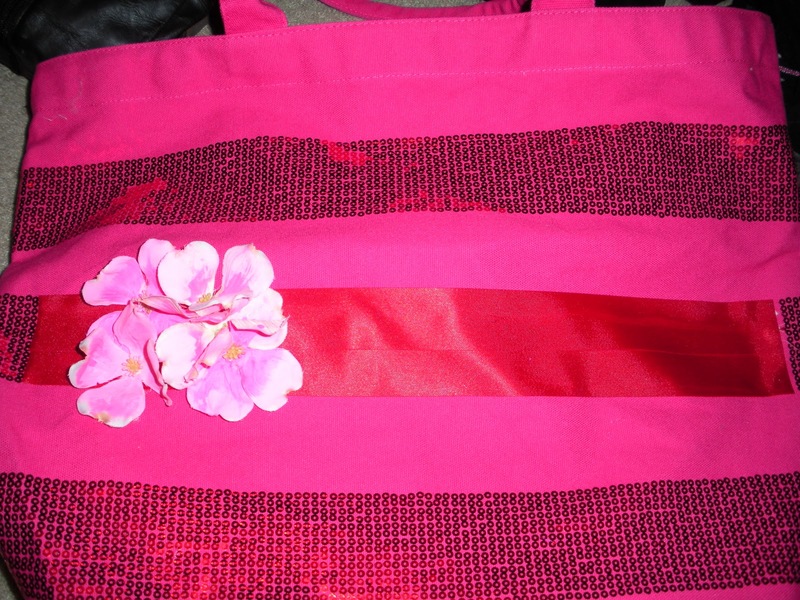 So, the first thing I did was gather a piece of fuchsia taffeta to use with the tote. I did it two ways, one was stretched across the center of the ribbon (to hide the seam) and the second was rolled into a flower. The former, you can see it pictured as the blog photo at the top. 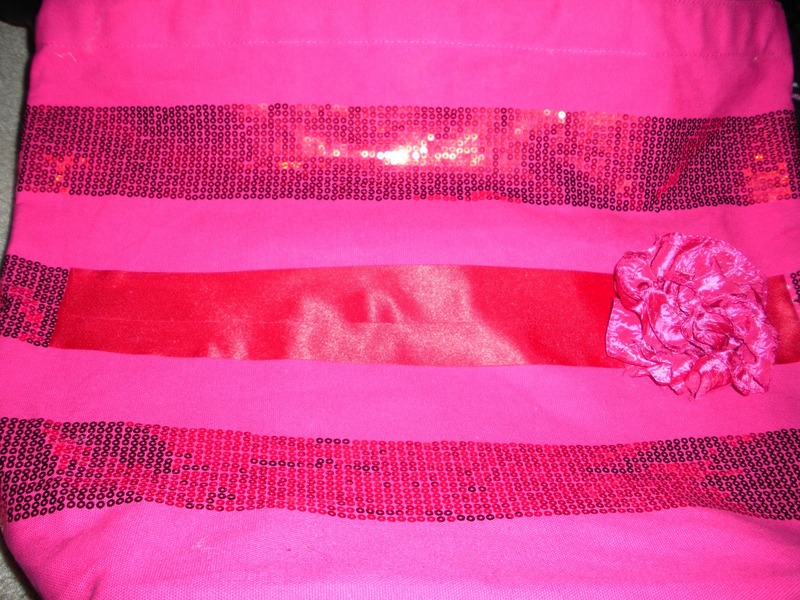 For the latter, I added a third piece of ribbon (I wish it was bright pink!) and wrote "la vie en rose" on it with a sharpie. I also threw on some silk flowers. I didn't love it with the ribbon, but a cluster of them on a simple canvas tote would be pretty. 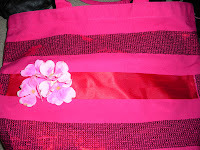 You could also cover the ribbon or fabric with a stamp. Just press the stamp into some acrylic paint, or for more intricate details/better control, brush it on with a paint brush. There is so much more that could be done here, but this is just a general idea. The other thing I want to show you is much more exciting! This is just a silly little tip, but it's fun. 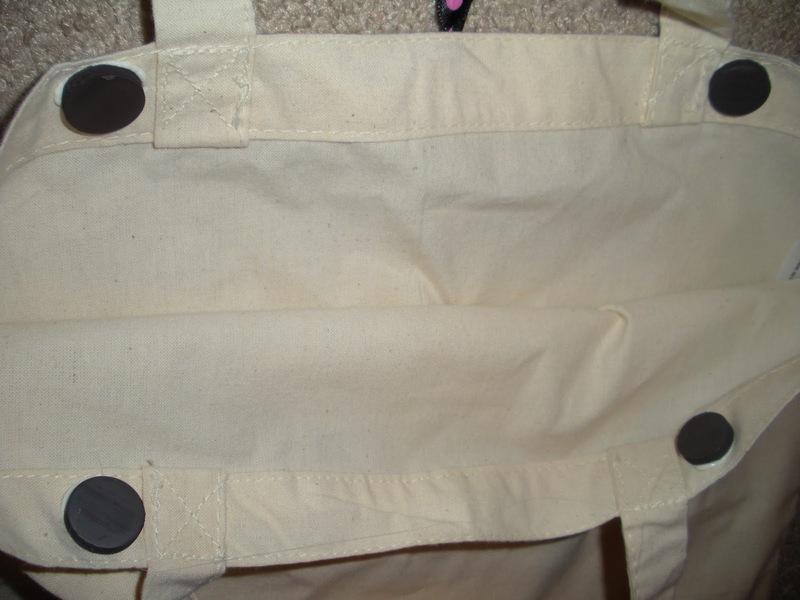 I discovered that if you hot glue magnets on the inside of your tote, you can not only have the option of closing it, but you can also alter the shape of your tote to fit your mood or the amount of items inside of it. All you did is push the corners in and then magnet the bag shut and it goes from being square to angled at the top! I like the look. I think it's cute. I'm actually adding magnets to all of the totes I own now, which just takes a minute and is super cheap. I paid $1.99 for 8 at Michael's. The last thing I'll show you is a little headband I made today. It's just like the ones I made in THIS OLD HAIR TUTORIAL. 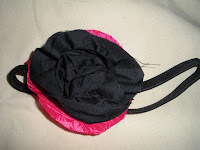 I used some of the extra gathered fabric and rolled it into a rose shape. I hot glued it on to a piece of bring pink fabric and attached it to the band. I'm making a ton of different pieces for the girls that took my shifts last week. They were so sweet to pick them up last minute so that I could attend my grandfather's funeral and viewing. I'm going to make lots of little things for them and then let them choose what they like. Kim, if you're reading- that's YOU!